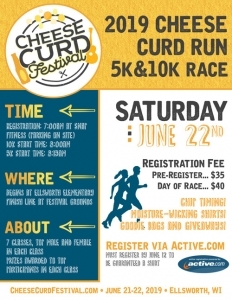 Join us as we run for the curds! Enjoy a 5K or 10K Run through the beautiful Western Wisconsin countryside past fields, farms, and amazing views. 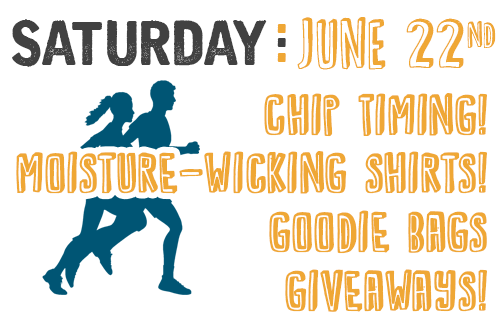 Cross the finish line at the Cheese Curd Festival grounds where we’ll be recognizing the winning runners in each category. Then plan to enjoy the day at the Festival, where we have many family-friendly activities for your enjoyment. Registration/Start: Ellsworth Elementary School, 445 S Piety St, Ellsworth. Restrooms and free parking and free shuttles available on-site. Packet pick-up begins at 7:00am. 7 classes, top male and female in each class. Medals awarded to top participants in each class. You can register online, right now! Want to tell other people about the race? Or have an awesome looking reminder for yourself? Download the Official Race Flyer here!